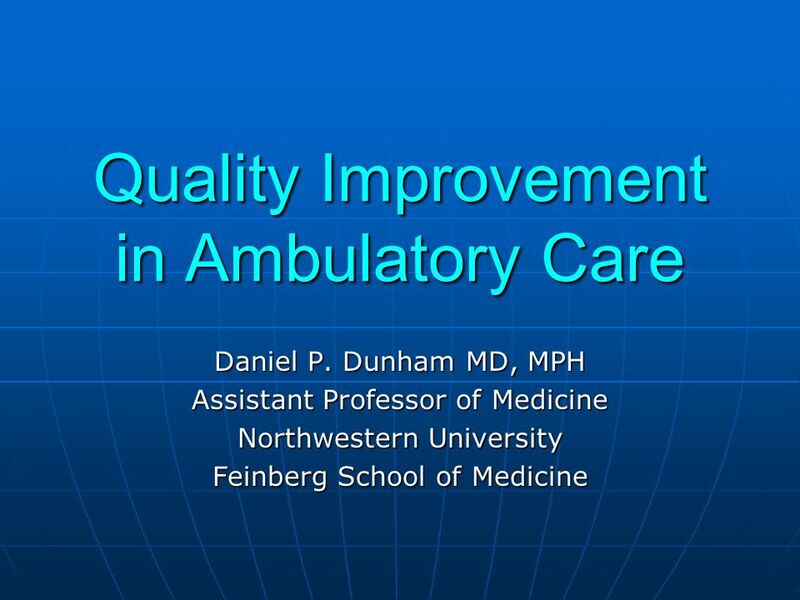 Quality Improvement in Ambulatory Care Daniel P. Dunham MD, MPH Assistant Professor of Medicine Northwestern University Feinberg School of Medicine. 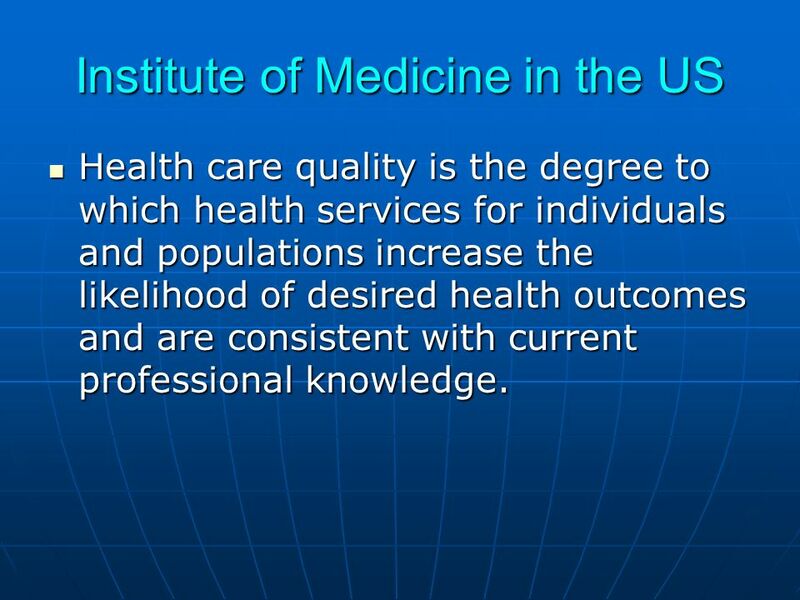 3 Institute of Medicine in the US Health care quality is the degree to which health services for individuals and populations increase the likelihood of desired health outcomes and are consistent with current professional knowledge. Health care quality is the degree to which health services for individuals and populations increase the likelihood of desired health outcomes and are consistent with current professional knowledge. 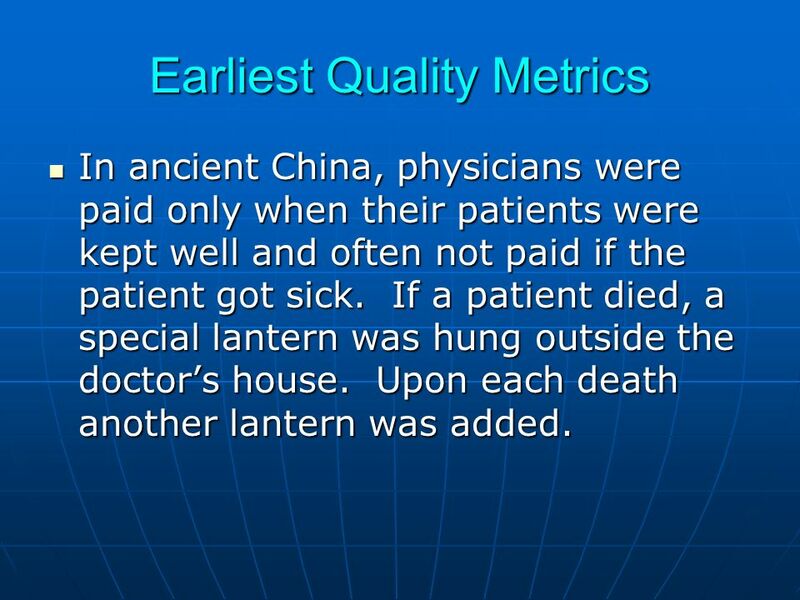 6 Earliest Quality Metrics In ancient China, physicians were paid only when their patients were kept well and often not paid if the patient got sick. If a patient died, a special lantern was hung outside the doctors house. Upon each death another lantern was added. In ancient China, physicians were paid only when their patients were kept well and often not paid if the patient got sick. If a patient died, a special lantern was hung outside the doctors house. Upon each death another lantern was added. 9 Hx(cont.) 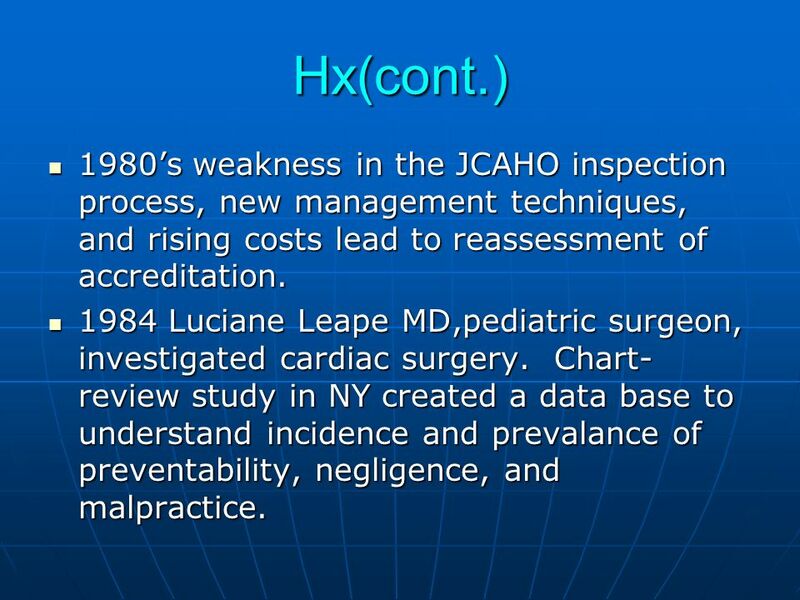 1980s weakness in the JCAHO inspection process, new management techniques, and rising costs lead to reassessment of accreditation. 1980s weakness in the JCAHO inspection process, new management techniques, and rising costs lead to reassessment of accreditation. 1984 Luciane Leape MD,pediatric surgeon, investigated cardiac surgery. Chart- review study in NY created a data base to understand incidence and prevalance of preventability, negligence, and malpractice. 1984 Luciane Leape MD,pediatric surgeon, investigated cardiac surgery. Chart- review study in NY created a data base to understand incidence and prevalance of preventability, negligence, and malpractice. 10 Hx(cont.) 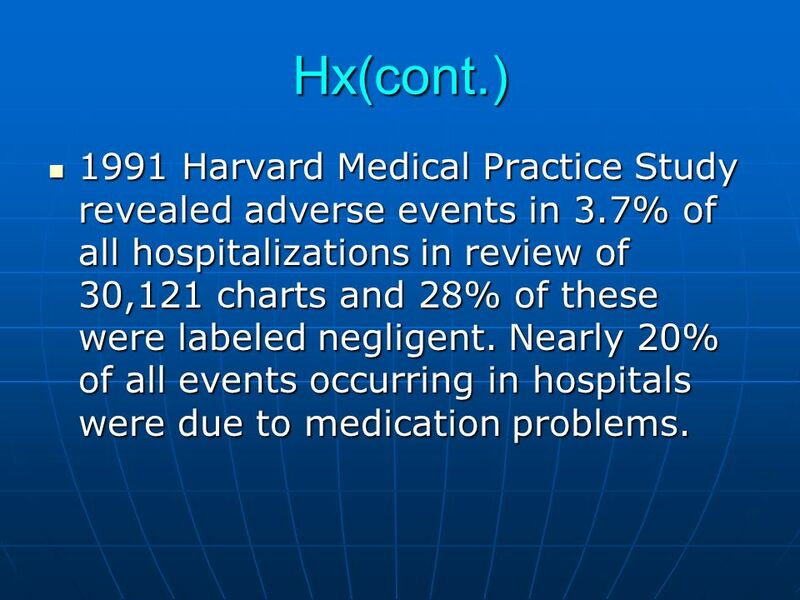 1991 Harvard Medical Practice Study revealed adverse events in 3.7% of all hospitalizations in review of 30,121 charts and 28% of these were labeled negligent. Nearly 20% of all events occurring in hospitals were due to medication problems. 1991 Harvard Medical Practice Study revealed adverse events in 3.7% of all hospitalizations in review of 30,121 charts and 28% of these were labeled negligent. 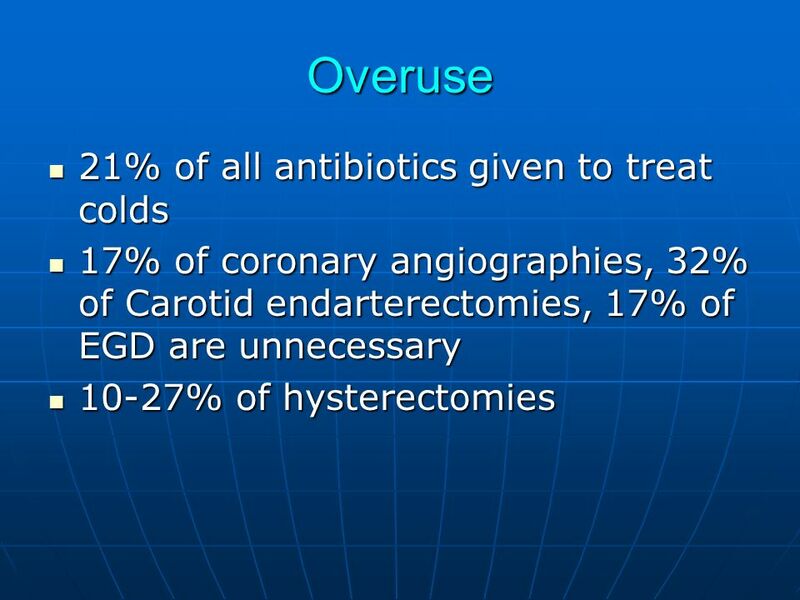 Nearly 20% of all events occurring in hospitals were due to medication problems. 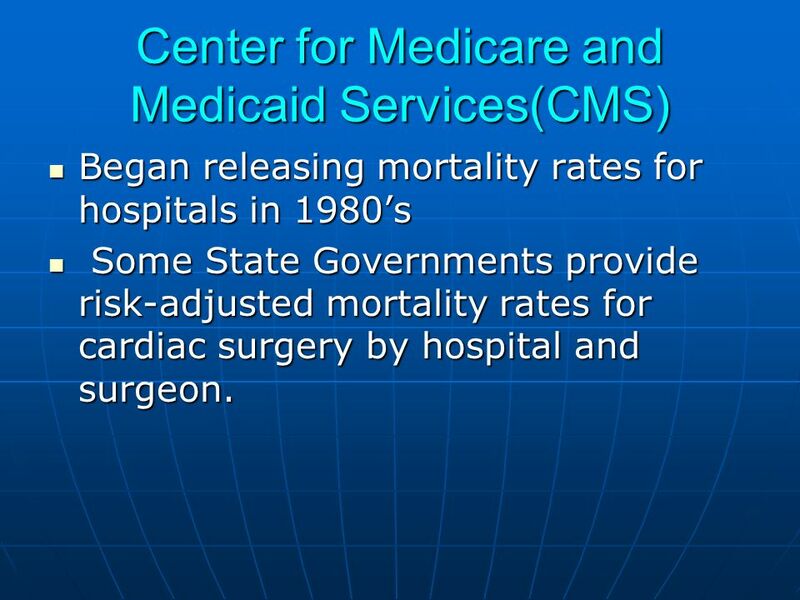 11 Center for Medicare and Medicaid Services(CMS) Began releasing mortality rates for hospitals in 1980s Began releasing mortality rates for hospitals in 1980s Some State Governments provide risk-adjusted mortality rates for cardiac surgery by hospital and surgeon. Some State Governments provide risk-adjusted mortality rates for cardiac surgery by hospital and surgeon. 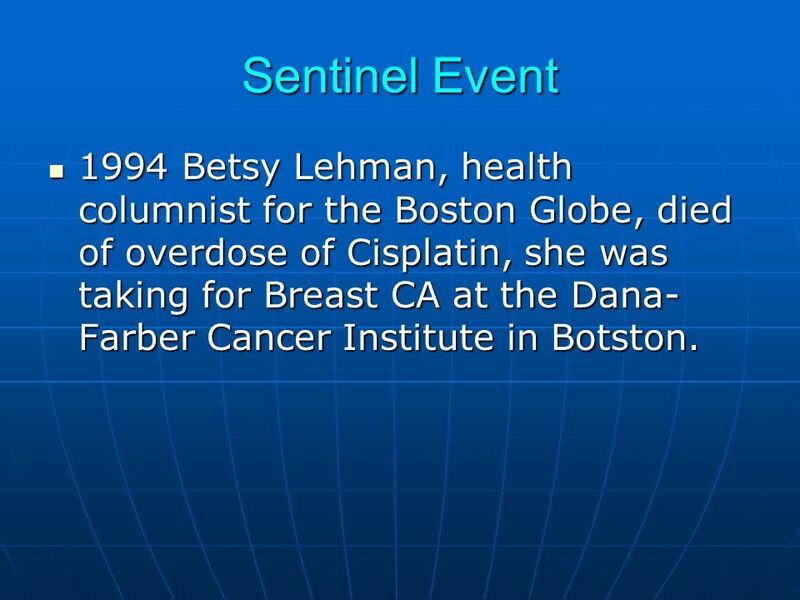 12 Sentinel Event 1994 Betsy Lehman, health columnist for the Boston Globe, died of overdose of Cisplatin, she was taking for Breast CA at the Dana- Farber Cancer Institute in Botston. 1994 Betsy Lehman, health columnist for the Boston Globe, died of overdose of Cisplatin, she was taking for Breast CA at the Dana- Farber Cancer Institute in Botston. 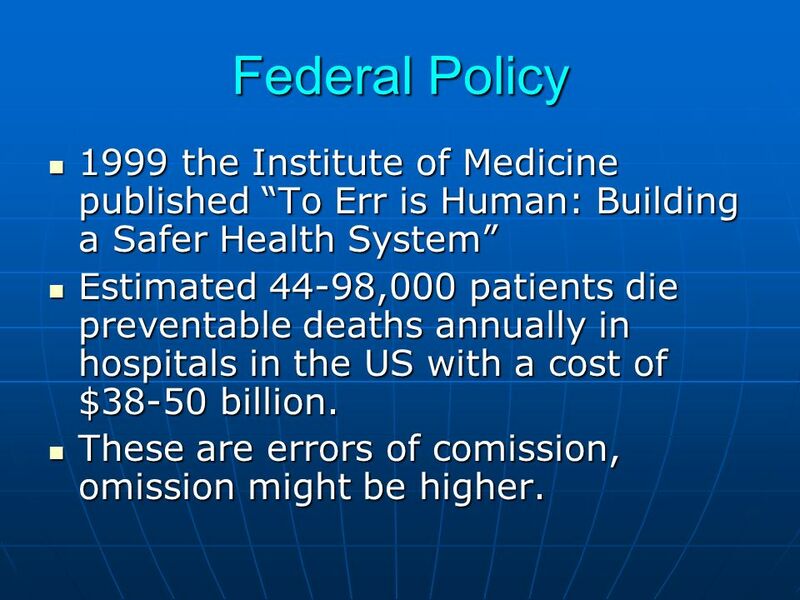 13 Federal Policy 1999 the Institute of Medicine published To Err is Human: Building a Safer Health System 1999 the Institute of Medicine published To Err is Human: Building a Safer Health System Estimated 44-98,000 patients die preventable deaths annually in hospitals in the US with a cost of $38-50 billion. Estimated 44-98,000 patients die preventable deaths annually in hospitals in the US with a cost of $38-50 billion. These are errors of comission, omission might be higher. These are errors of comission, omission might be higher. 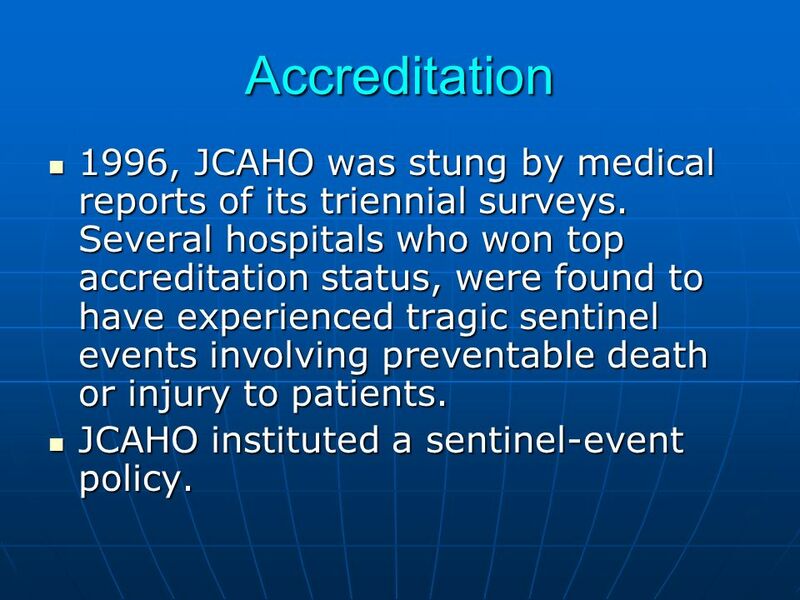 14 Accreditation 1996, JCAHO was stung by medical reports of its triennial surveys. Several hospitals who won top accreditation status, were found to have experienced tragic sentinel events involving preventable death or injury to patients. 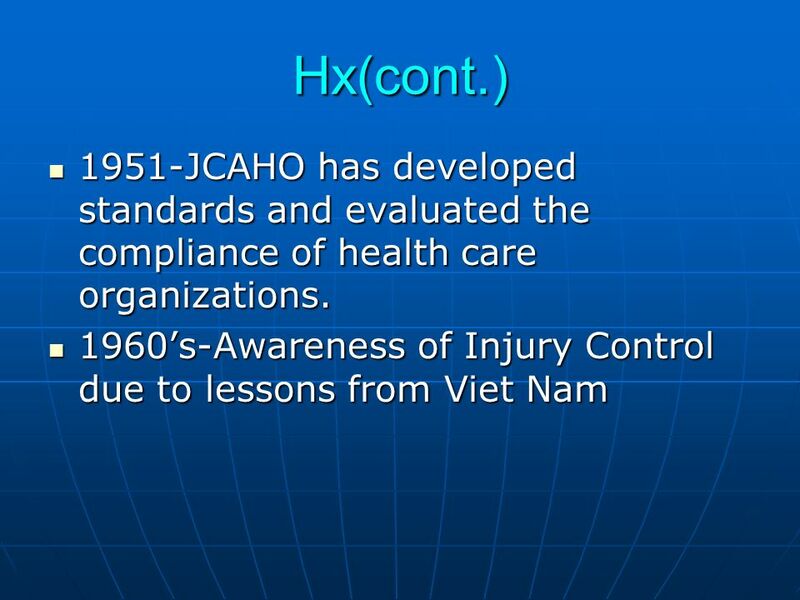 1996, JCAHO was stung by medical reports of its triennial surveys. Several hospitals who won top accreditation status, were found to have experienced tragic sentinel events involving preventable death or injury to patients. JCAHO instituted a sentinel-event policy. JCAHO instituted a sentinel-event policy. 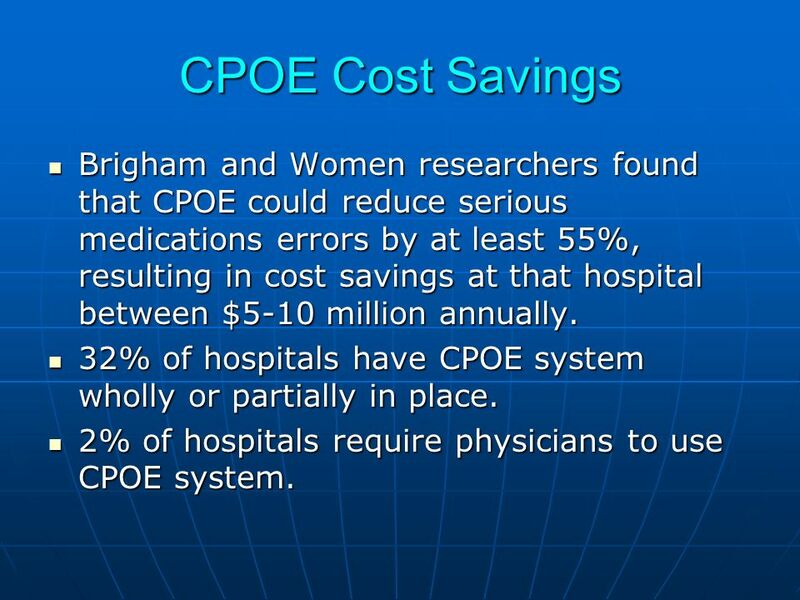 17 CPOE Cost Savings Brigham and Women researchers found that CPOE could reduce serious medications errors by at least 55%, resulting in cost savings at that hospital between $5-10 million annually. Brigham and Women researchers found that CPOE could reduce serious medications errors by at least 55%, resulting in cost savings at that hospital between $5-10 million annually. 32% of hospitals have CPOE system wholly or partially in place. 32% of hospitals have CPOE system wholly or partially in place. 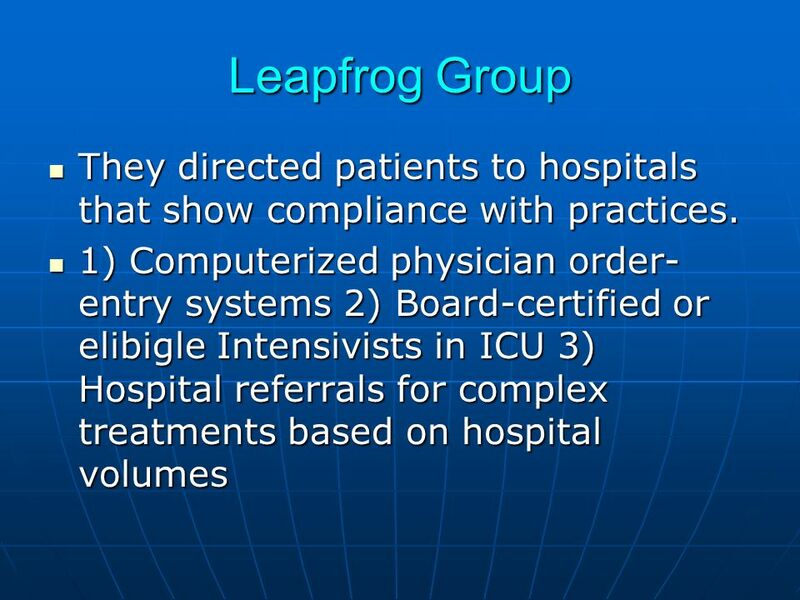 2% of hospitals require physicians to use CPOE system. 2% of hospitals require physicians to use CPOE system. 18 Cost of Adverse Drug Event Brigham and Womens study showed 10.7 non intercepted Serious medication errors per 1000 patient- days. Brigham and Womens study showed 10.7 non intercepted Serious medication errors per 1000 patient- days. 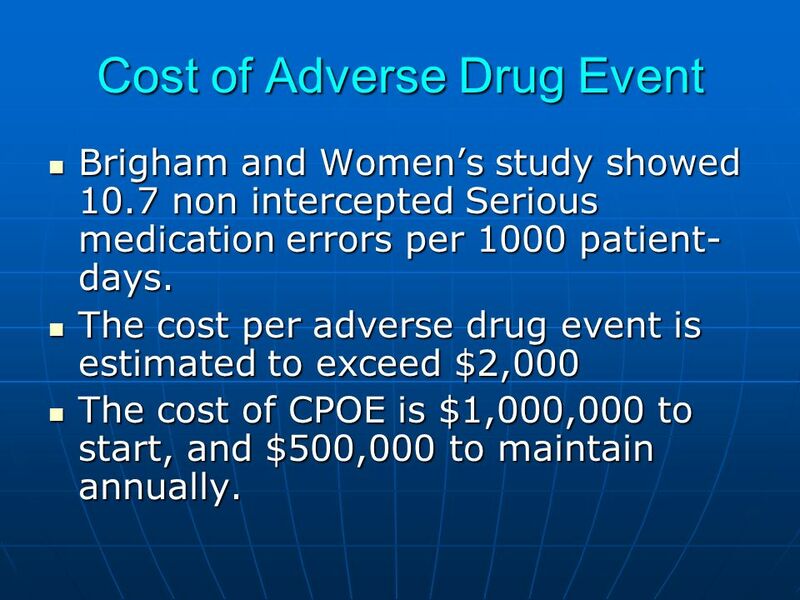 The cost per adverse drug event is estimated to exceed $2,000 The cost per adverse drug event is estimated to exceed $2,000 The cost of CPOE is $1,000,000 to start, and $500,000 to maintain annually. The cost of CPOE is $1,000,000 to start, and $500,000 to maintain annually. 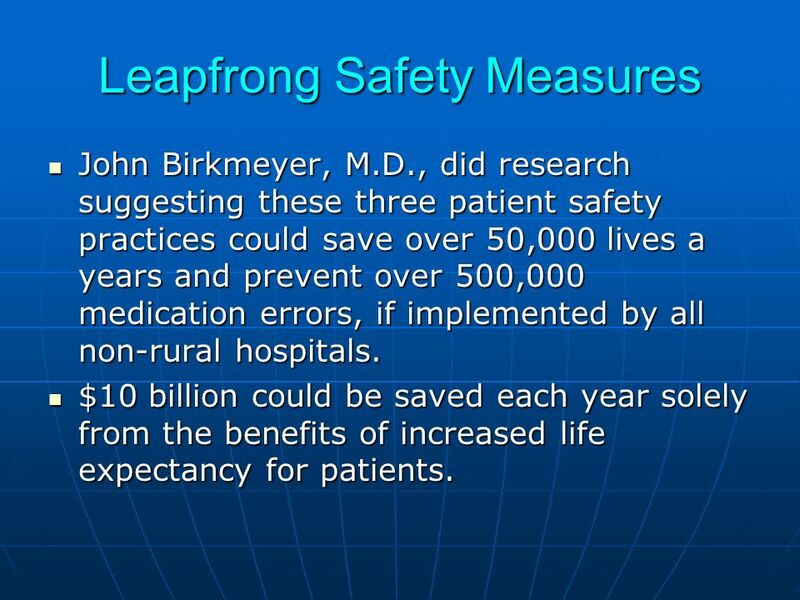 19 Leapfrong Safety Measures John Birkmeyer, M.D., did research suggesting these three patient safety practices could save over 50,000 lives a years and prevent over 500,000 medication errors, if implemented by all non-rural hospitals. John Birkmeyer, M.D., did research suggesting these three patient safety practices could save over 50,000 lives a years and prevent over 500,000 medication errors, if implemented by all non-rural hospitals. $10 billion could be saved each year solely from the benefits of increased life expectancy for patients. $10 billion could be saved each year solely from the benefits of increased life expectancy for patients. 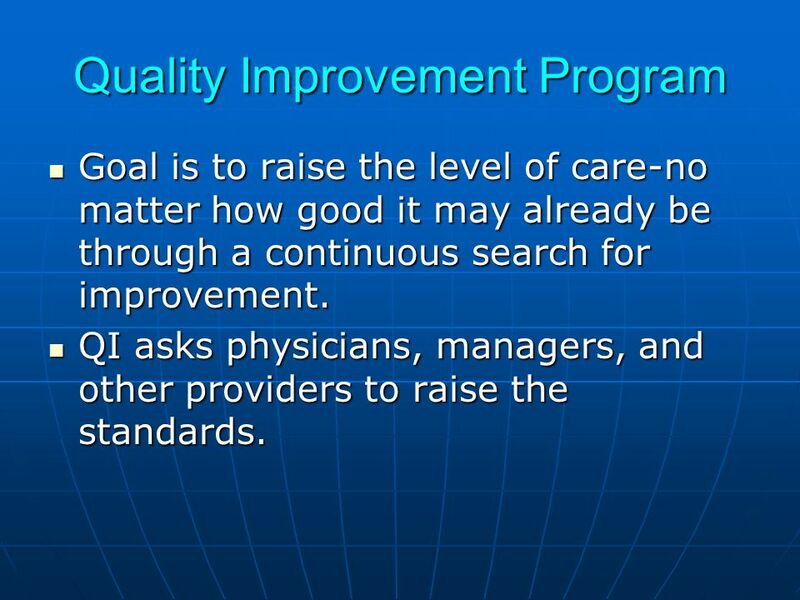 25 Quality Improvement Program Goal is to raise the level of care-no matter how good it may already be through a continuous search for improvement. 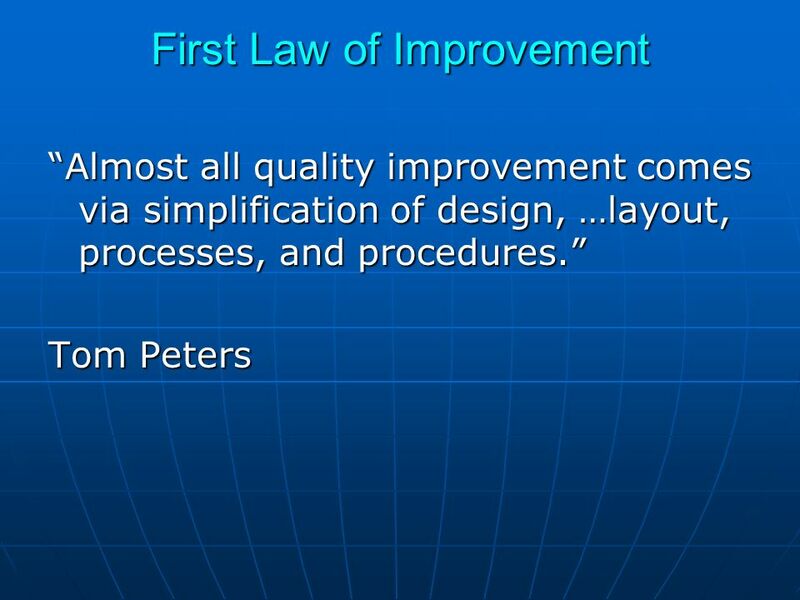 Goal is to raise the level of care-no matter how good it may already be through a continuous search for improvement. 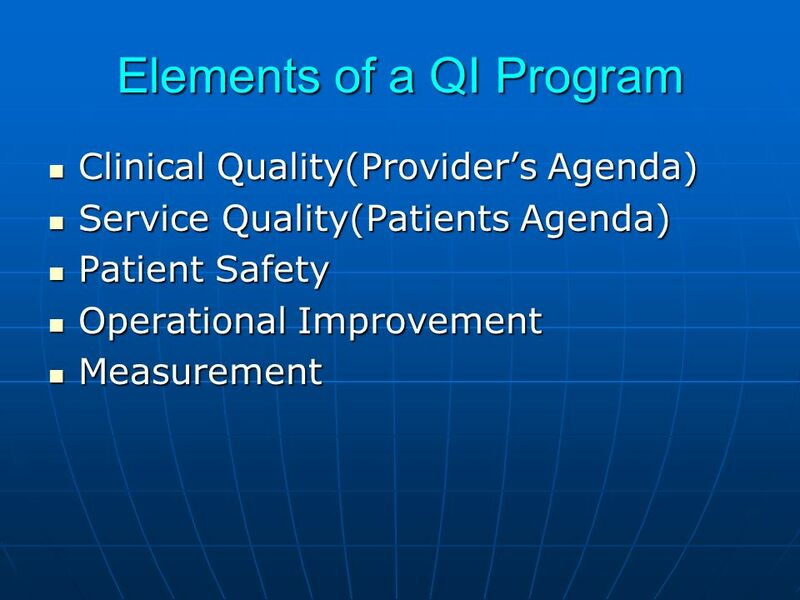 QI asks physicians, managers, and other providers to raise the standards. 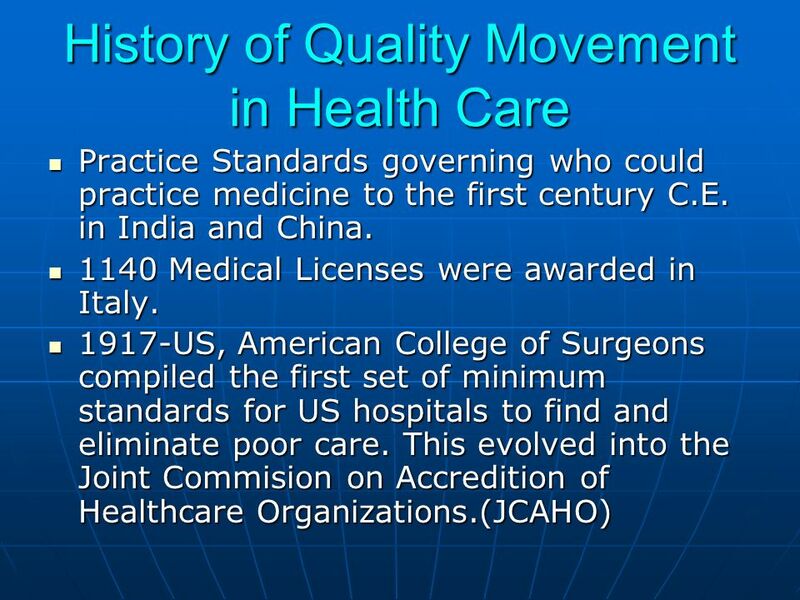 QI asks physicians, managers, and other providers to raise the standards. 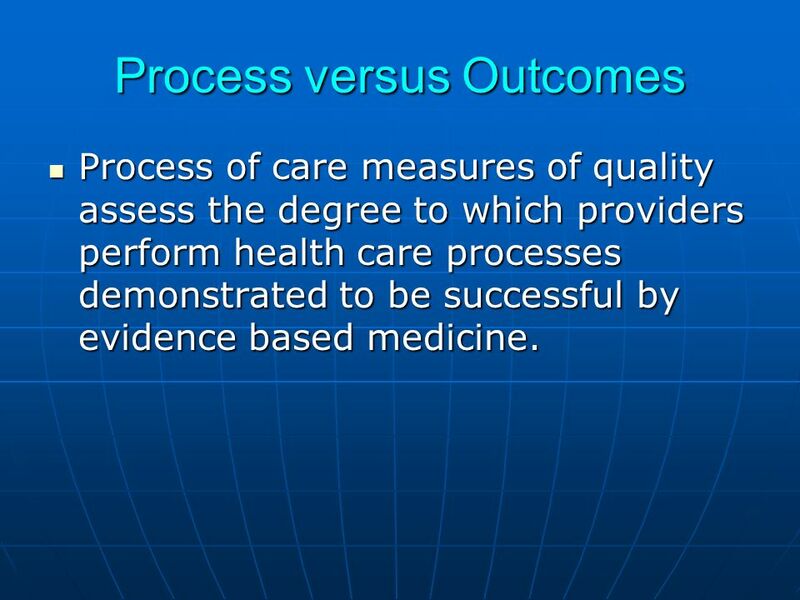 28 Process versus Outcomes Process of care measures of quality assess the degree to which providers perform health care processes demonstrated to be successful by evidence based medicine. 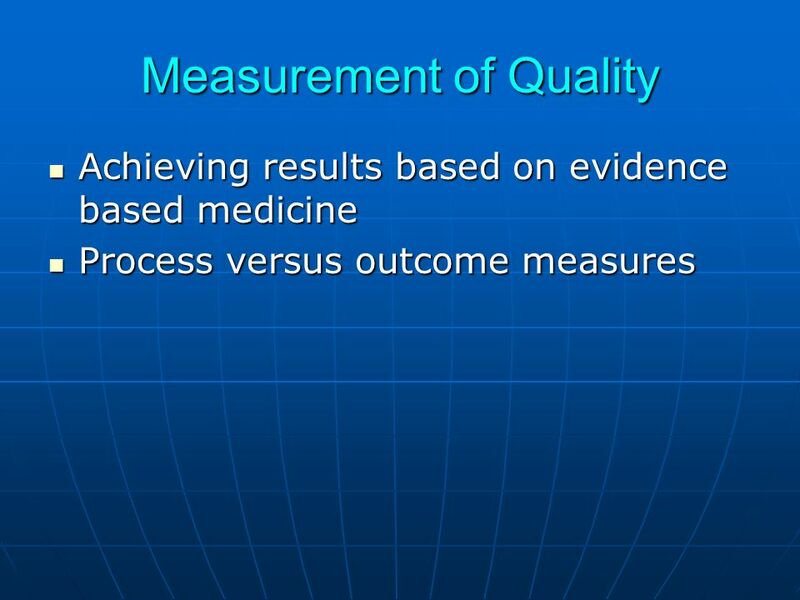 Process of care measures of quality assess the degree to which providers perform health care processes demonstrated to be successful by evidence based medicine. 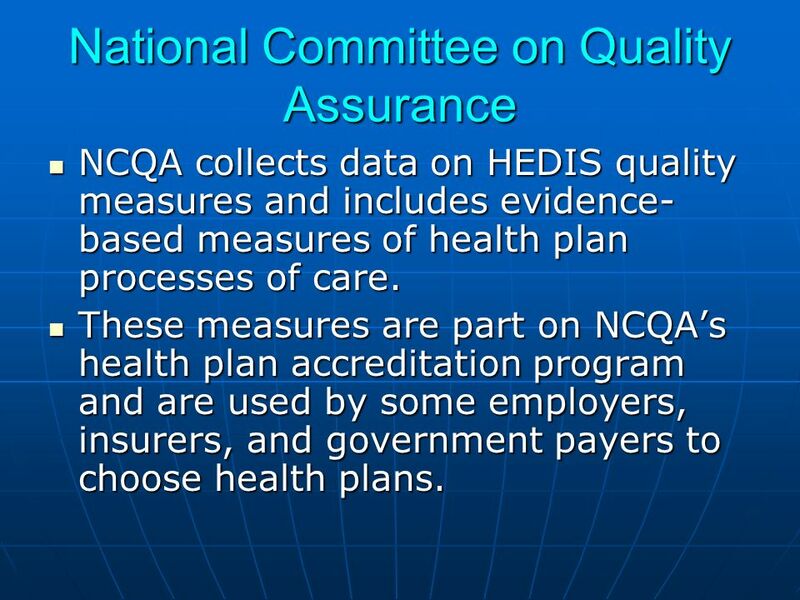 29 National Committee on Quality Assurance NCQA collects data on HEDIS quality measures and includes evidence- based measures of health plan processes of care. 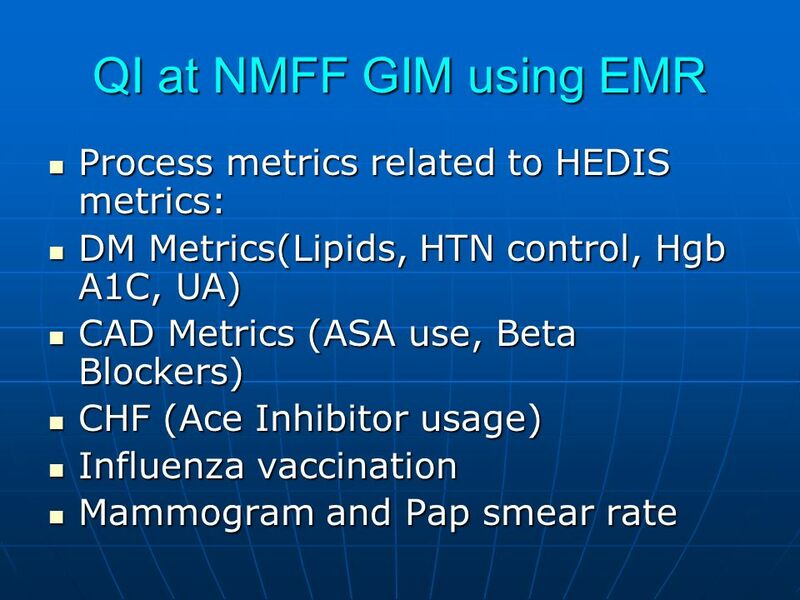 NCQA collects data on HEDIS quality measures and includes evidence- based measures of health plan processes of care. These measures are part on NCQAs health plan accreditation program and are used by some employers, insurers, and government payers to choose health plans. These measures are part on NCQAs health plan accreditation program and are used by some employers, insurers, and government payers to choose health plans. 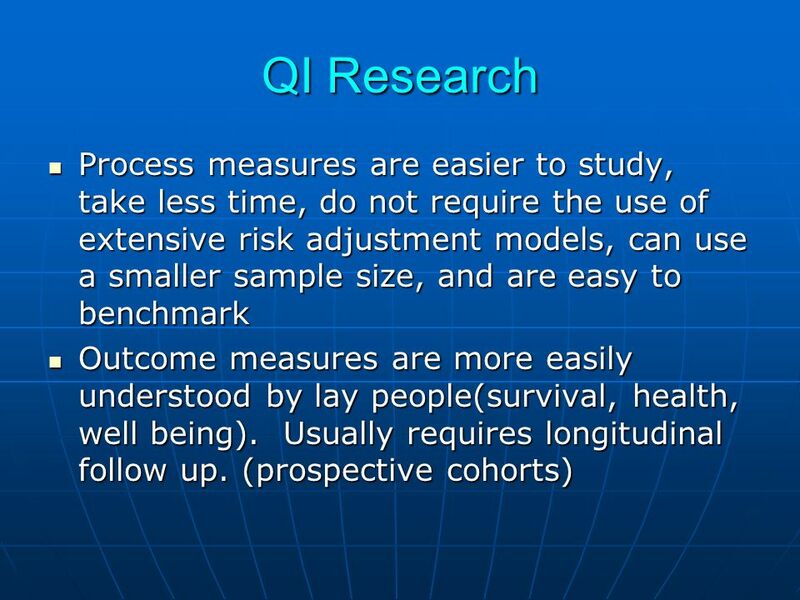 34 QI Research Builds on previous work found to improve the quality of Health Care Builds on previous work found to improve the quality of Health Care Can measure process or outcomes Can measure process or outcomes Valid and relevant (high risk or high volume diseases). 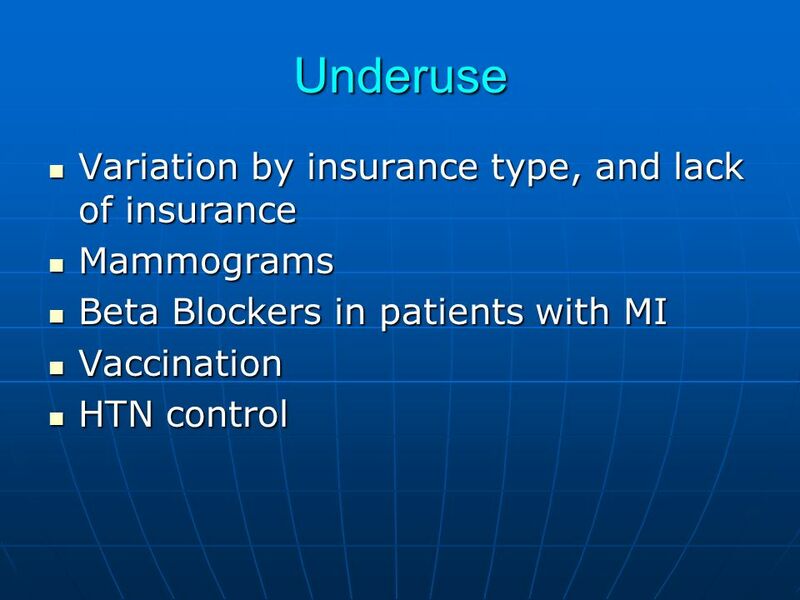 Valid and relevant (high risk or high volume diseases). 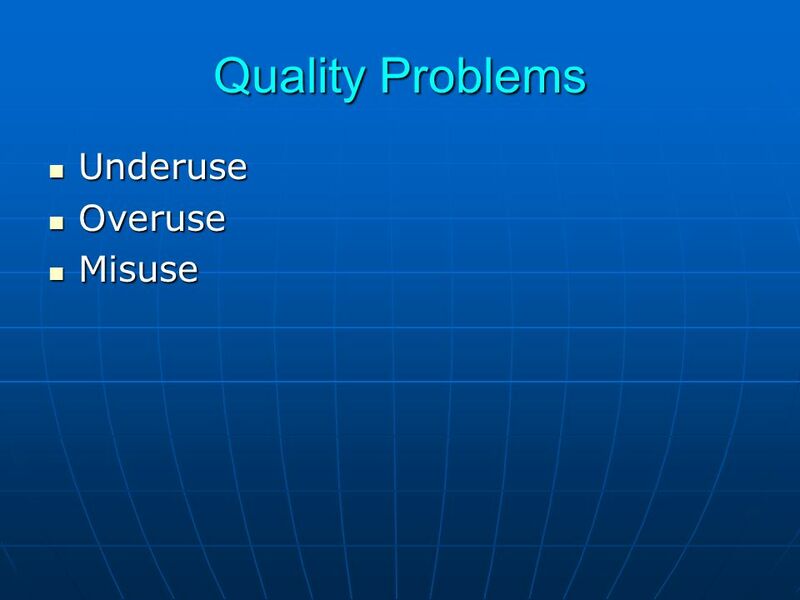 Evidence Based: Non-evidence- based CQI most often fails. 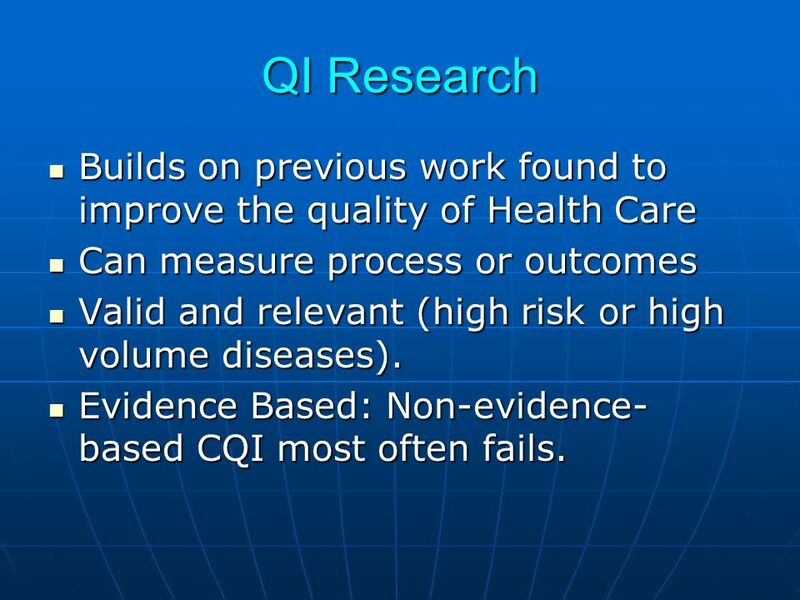 Evidence Based: Non-evidence- based CQI most often fails. 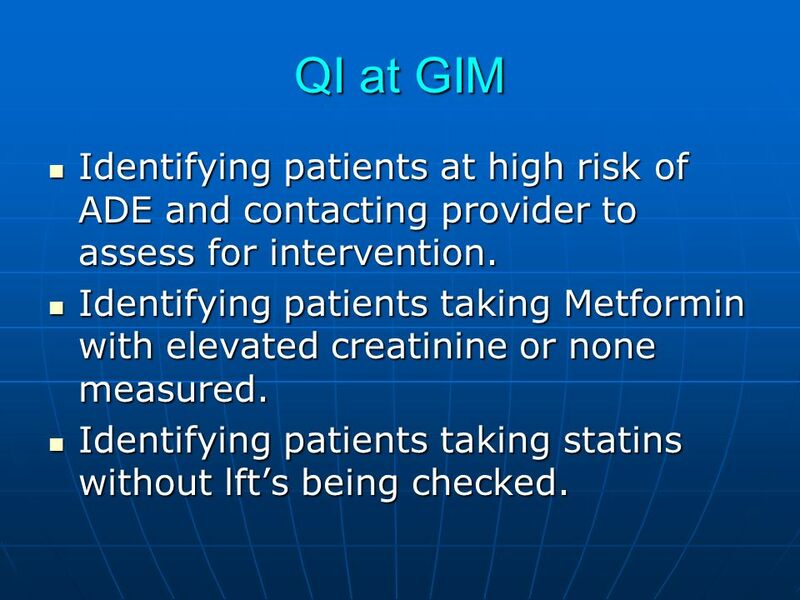 37 QI at GIM Identifying patients at high risk of ADE and contacting provider to assess for intervention. Identifying patients at high risk of ADE and contacting provider to assess for intervention. 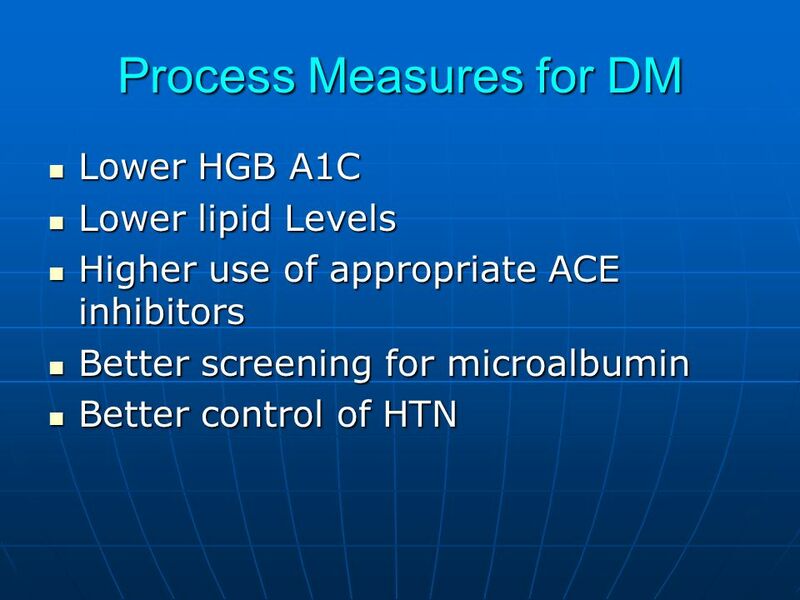 Identifying patients taking Metformin with elevated creatinine or none measured. Identifying patients taking Metformin with elevated creatinine or none measured. 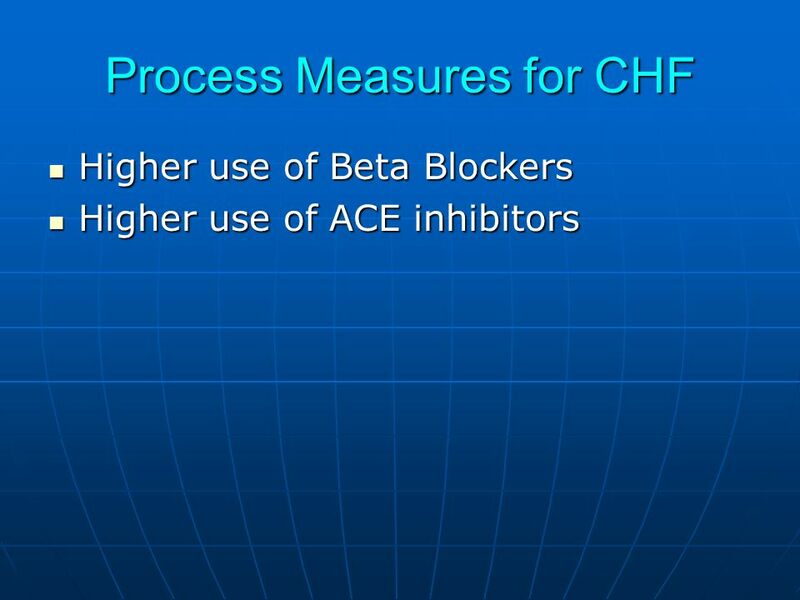 Identifying patients taking statins without lfts being checked. Identifying patients taking statins without lfts being checked. 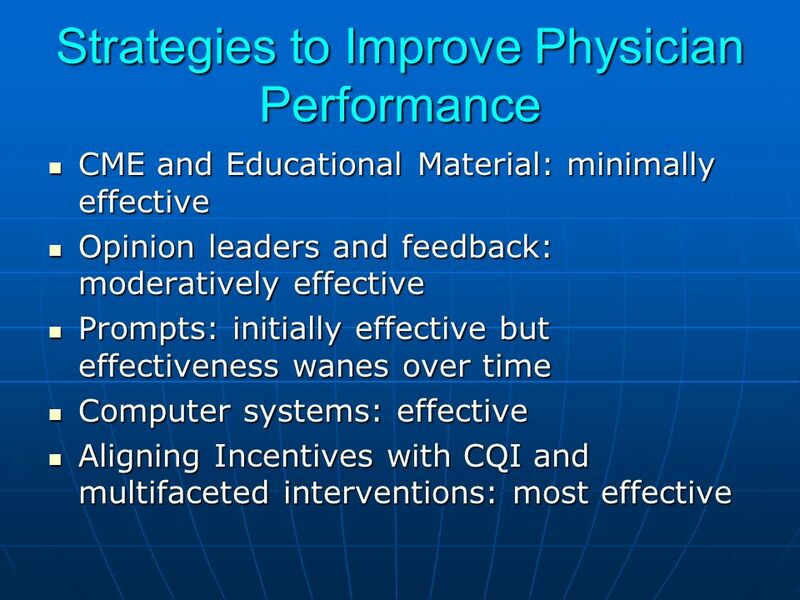 Download ppt "Quality Improvement in Ambulatory Care Daniel P. Dunham MD, MPH Assistant Professor of Medicine Northwestern University Feinberg School of Medicine." AHCPR 1 Enhancing the Consumer Health Experience J. Michael Fitzmaurice, Ph.D. Agency for Health Care Policy and Research April 27, 1999. 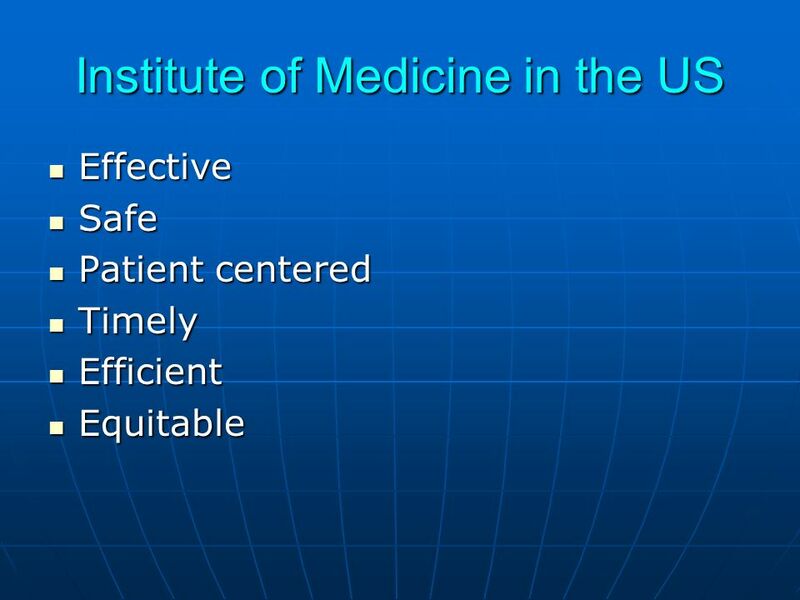 Medical Education Outcomes Research Frederick Chen, MD, MPH Center for Primary Care Research Agency for Healthcare Research and Quality June 26, 2003. 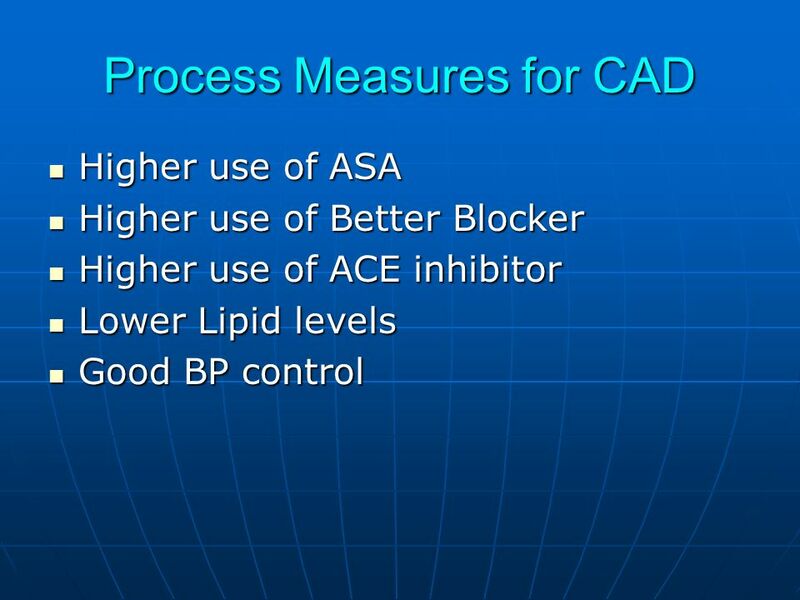 Promising Practices Related To The Prevention, Control and Treatment of Hypertension David J. Hyman, MD, MPH Professor of Medicine and Family & Community. Institute For Healthcare Improvements 100k lives Campaign Clint MacKinney, MD, MS Duluth, Minnesota July 19, 2005. 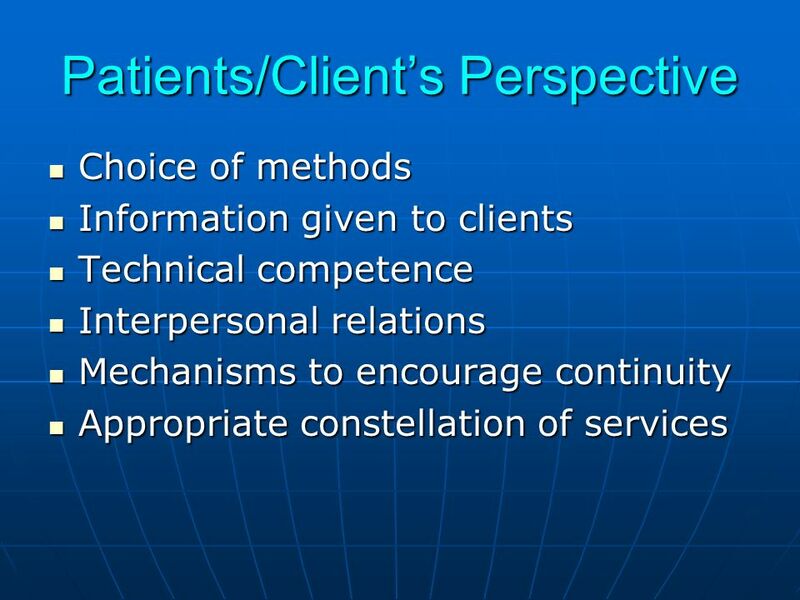 Using Information Technology and Community-based Research to Improve the Dental Health Care System Kathryn A. Atchison, DDS, MPH Professor, Division of. Medical Errors, Negligence, and Litigation Harvey Murff, M.D.,M.P.H. 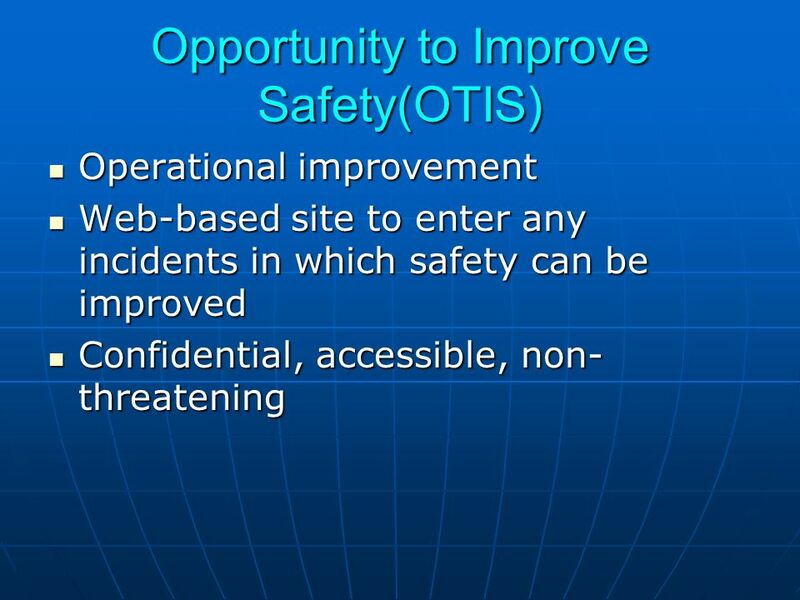 Center for Improving Patient Safety Vanderbilt University. 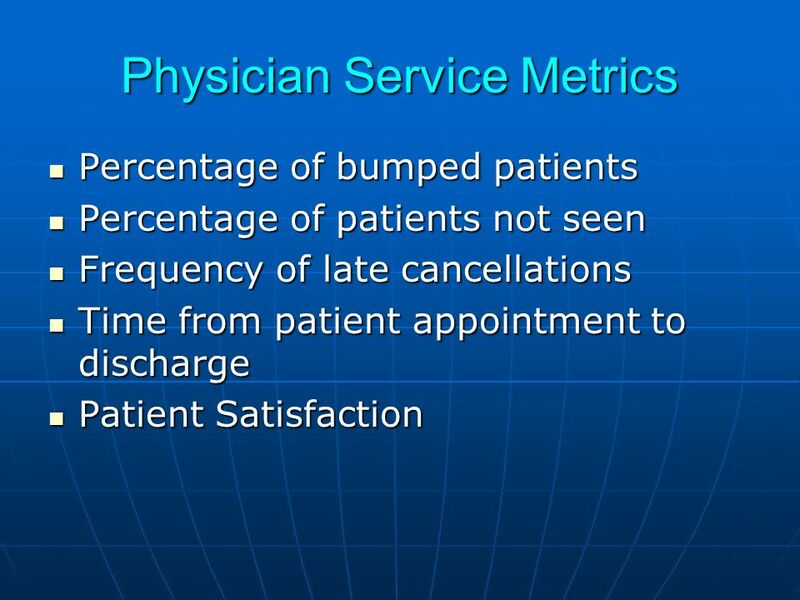 The Utility of PPRNet Reports in a Federally Qualified Health Center and Residency Program Kimberly Williams, MD August 22, 2014 Smoky Hill Family Medicine. My Mom’s Legacy Our Mission Prevent medical errors by ensuring that patients and families have the KNOWLEDGE they need to promote a safe hospital experience. 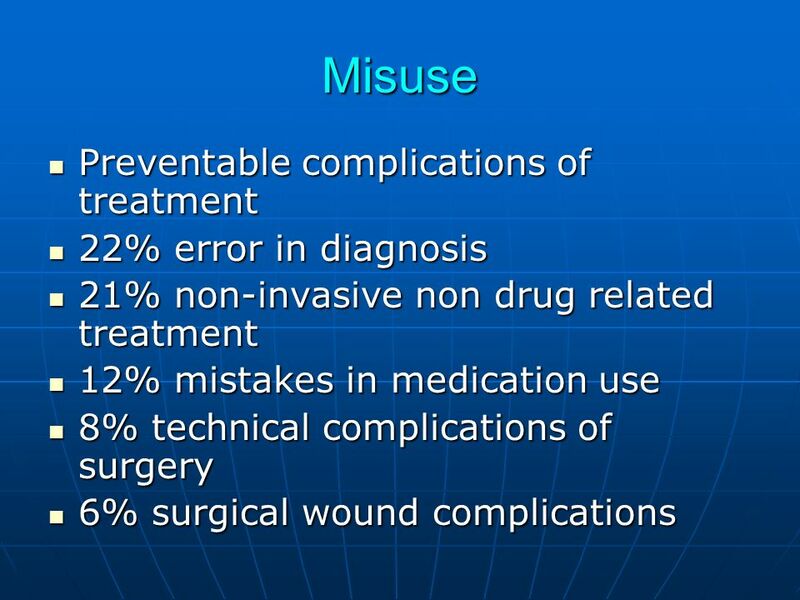 Medical Errors in the Hospital Amit Chatterjee, MD The Ohio State University July 21, 2009. 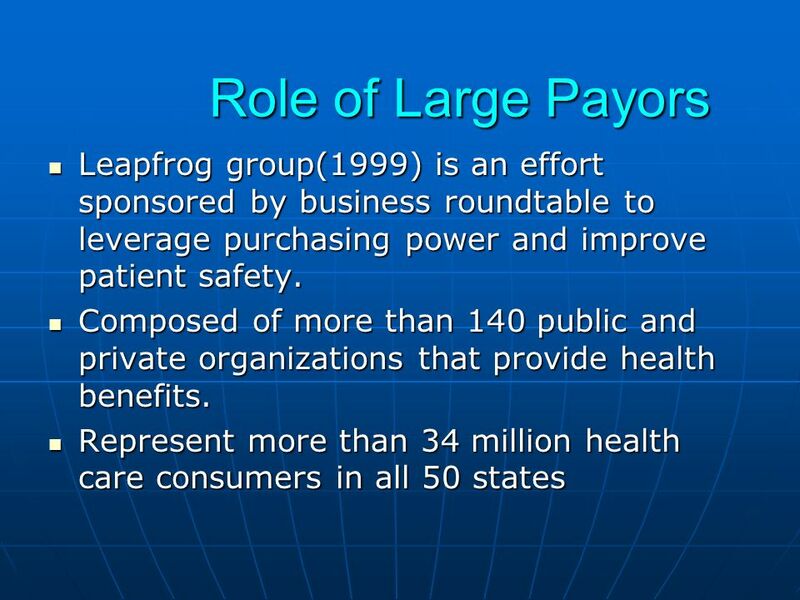 The Business of Health Care Improving Health through Healthcare Policies and Quality Standards. TIGER Standards & Interoperability Collaborative Informatics and Technology in Nursing. Dr. ABDULLAH ABDU ALMIKHLAFY Assistant professor & Head of community medicine department Presented By University of Science & Technology Sana’a – Yemen. 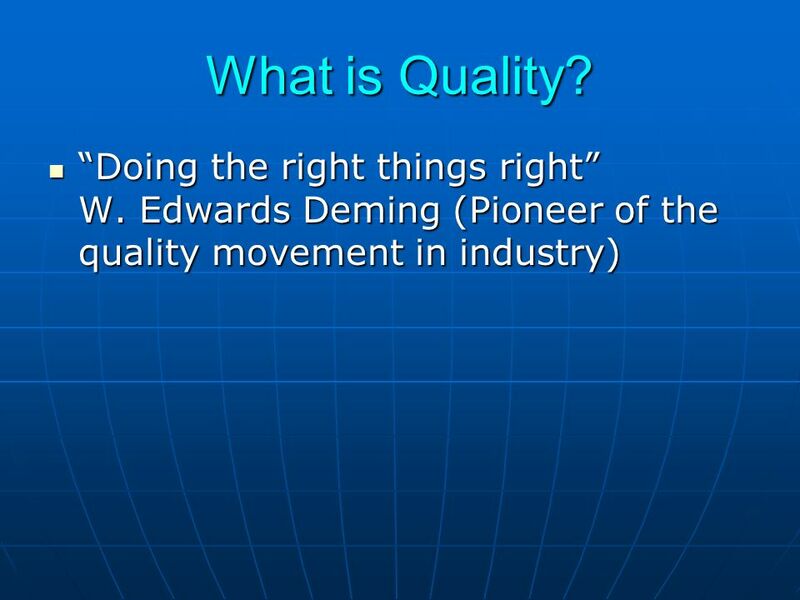 Quality Measurement: It’s Everyone’s Responsibility Kay Bensing, MA, RN ADVANCE for Nurses. 2003: Improvements and Other Changes Francois de Brantes May, 2003 Founded by The Business Roundtable Supported by the Robert Wood Johnson Foundation.